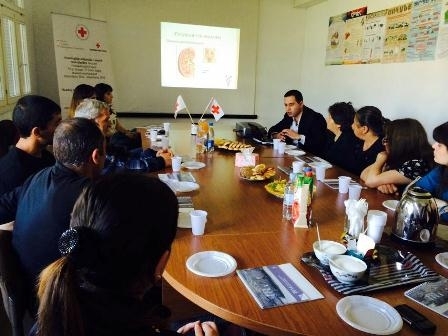 In May 2014, 2 meetings were held in ARCS Lori Regional branch with missing person’s family members and Young Doctors Association 5 doctors from Yerevan (urologist, endocrinologist, cardiologist, neurologist and gynecologist). These specialists were invited taking into consideration the desire of the missing persons family group. 8 members of missing persons family attended first meeting, and 9 members participated in the second meeting. During the meetings, doctors presented preventive measures of frequent diseases, reasons of their progression and other useful information through presentation materials. Missing persons family members actively participated in the meetings, by addressing multiple questions about their own health issues. Individual consultations also were provided. This kind of meetings are effective for the families of missing persons, as they receive the necessary information about their concerns, saving their extremely insufficient financial means and receive proper guidance on their following steps. From 2012 up to now, ARCS Lori Regional branch, in cooperation with ICRC, implements a project on supporting families of missing persons, as a result of the Nagorno-Karabakh conflict. 24 families from Lori are involved in the project. In the frame of the project, for the members of missing persons families meetings with health, social, legal professionals, cultural events and different professional courses are being organized. Assistance to protect their interests in health, social, legal and other areas has been given to the families of missing persons. In this case ARCS Lori Regional branch cooperates with local self-government bodies and with private and public organizations.